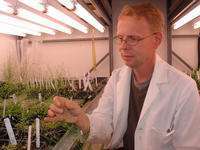 (PhysOrg.com) -- Aluminum toxicity, a global agricultural problem, halts root growth in plants, severely limiting agricultural productivity for more than half of the world's arable land. For many years, scientists have puzzled over how toxic levels of aluminum damage the growing root. The popular understanding is that aluminum binds to several targets in the root system, blocking cell division, damaging DNA, and ultimately interrupting plant growth. Now, working on the model plant Arabidopsis, a team of UC Riverside biochemists has determined that it is not aluminum toxicity that is directly responsible for inhibiting plant growth. The researchers identified a factor in plant cells, called AtATR, that functions as a built-in DNA surveillance system for alerting the plant of damage from excess aluminum and shutting down growth. The researchers' experiments showed that AtATR can be manipulated to greatly enhance aluminum tolerance, resulting in plants whose roots can grow normally in soils that contain toxic levels of aluminum. Study results appear in the Oct. 14 issue of Current Biology. "Plants actively monitor aluminum-dependent damage through AtATR," said Paul Larsen, an associate professor of biochemistry and the lead author of the study. "But by breaking this assessment mechanism in a plant growing in soil with high aluminum content, we were able to stimulate plant growth again because the plant was no longer able to sense the damage aluminum caused. In other words, by bypassing this growth checkpoint, plants are not able to sense the effects of aluminum; they continue to grow even in an aluminum-toxic environment that is highly inhibitory to a normal Arabidopsis plant." The research, which gives scientists new insights into how aluminum tolerance works in plants, offers a new strategy for engineering crop plants that can tolerate growth in aluminum-toxic environments, increasing crop production in areas that otherwise could not sustain agriculture. "Dr. Larsen's work is a significant breakthrough in our understanding of how aluminum toxicity inhibits root growth," said Leon Kochian, a professor of plant biology at Cornell University, who was not involved in the research. "What he has shown, using an elegant combination of genetics, molecular biology and physiology, is that aluminum causes DNA damage in the growing root tip. The cells of this region have a mechanism to monitor this damage and shut down cell division and thus, root growth." Larsen explained that a root tip has a "quiescent center" that houses stem cells – master cells, maintained throughout the life of the root, that develop into cell types and tissues. Aluminum toxicity results in the loss of these stem cells, and consequently cell division, bringing growth to a halt. "Knocking off AtATR's functioning maintains the quiescent center," said Larsen, who joined UCR's Department of Biochemistry in 2000. "In our study, we broke AtATR throughout the plant. But if we can break this factor only in the root tip, the plant will not sense aluminum's damage to the root. The root then continues to grow and we regain productivity." The researchers' experiments involved introducing random mutations throughout the genome of Arabidopsis and screening for those roots that can grow in the presence of high levels of aluminum. A silvery-white metal, aluminum is the most abundant metallic element in the Earth's crust. Never found in the metallic form in nature, it occurs instead in compounds. Next, Larsen's lab will work on identifying other factors in plants that detect DNA damage. His lab also plans to induce the AtATR mutation into crop plants such as tomato and corn to increase their aluminum tolerance. So what are the consequences of disabling this safety mechanism? It sounds as if the root continues to grow in spite of DNA damage caused by the high levels of aluminum. Does this have consequences? Unfortunately, this advancement will probably meet with a great deal of resistance because so much of the world is highly biased against genetically modified organisms.